We want you to SHOOT OUR NEXT VIDEO Advertisement! Show us how Mickey’s innovative tread, tough carcass and state-of-the-art compounds deliver the ultimate performance for off-roaders. Shoot it, Cut it and Post it online for your chance to win a legendary prize pack worth $3,500 and we’ll feature it on TV! Hurry, entries close April 30! Terms and conditions apply. Click here for full terms and conditions. Shoot your TV commercial, Read these guidelines for success! Cut your video. Entries can be anywhere between 30 to 60 seconds long. See the guidelines here for specifications. 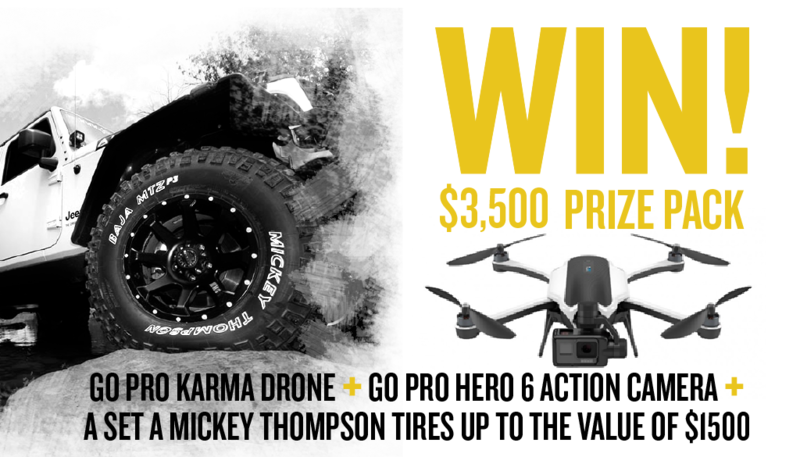 Upload your video to YouTube and send us the link using the form below, or via email to marketing@mickeythompsontires.com.au. Check back on the 11th May to see if you've won! The winner will be announced online here, and notified via phone and email. Submit your video here for your chance to WIN!